The most prestigious championship and the highest honour in local trotting takes off next Sunday 31st March 2019, as the top 72 horses challenge each other in 6 heats over the distance of 2640m. 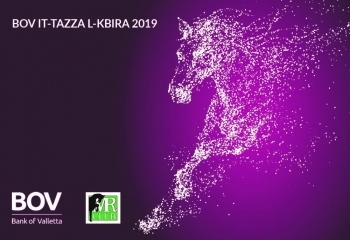 As a major supporter of sporting initiatives in Malta, Bank of Valletta will again be the main sponsor of this race, considered the top honour in the Malta Racing Club’s annual calendar. This is also reflected in the highest prize money in local horse-racing where a total of €6,550 will be distributed between the first five finishers of the final being held on Sunday 28th April. 85 years since Frise Poulet took the first ever Tazza l-Kbira in 1934, every owner and driver still dreams of putting his name on the trophy. This year’s final guarantees a new horse winning as none of the previous winners will be contesting this year’s competition. Following the semi-finals, the owners of the 12 finalist horses will draw their starting number for their place behind the autostart in the final themselves. The draw will be held during a press conference where information where more information about the final, the top racing day of the year, will be shared.